If you prefer new AMD Fusion E-350 APU platform to nVidia Ion 2 for your HTPC the Giada MiniPC A50 might be interesting for you. It’s based on a AMD Fusion E-350 APU with integrated Radeon HD 6310 graphics and supports HD video and audio. The slim case – just 25 mm, has enough space for 2GB of RAM and 2.5″ 350GB HDD. The Giada MiniPC A50 sports HDMI output, USB 3.0 port, Gigabit Ethernet, 802.11n WiFi, built-in IR receiver and multi-card reader. 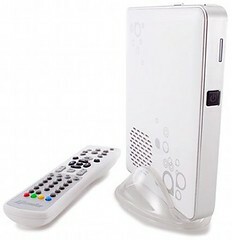 The box is bundled with Media Center remote to control it the same way as the rest AV devices. The Giada MiniPC A50 will be available in two colors – black and white, and in two configurations – ready-made with Windows 7 Home Premium ($449) and barebone ($299). Good to know this PC is compatible with Linux. So, you may install XBMC, Boxee, MythTV with a networked HDHomeRun tuner or VDR with USB DVB-S2 card and enjoy power and open source system on your quiet (just 26dB noise level) and energy efficient (30W power consumption) HTPC. You already heard about Zotac ZBOX nettop with Blu-ray player and nVidia Ion 2 graphics, I suppose. Now it’s time to announce the new ZBOX Blu-ray AD03. It based on the latest AMD dual-core 1.6Ghz processor and 500Mhz Radeon HD 6310 graphics. It give you support of DirectX 11 3D, 1080p video, Blu-ray playback, and Dolby TrueHD / DTS-HD Master Audio over HDMI (remember that nVidia Ion 2 model doesn’t support HD audio). The ZBOX Blu-ray AD03 sports USB 3.0 ports, Mini-PCI Express expansion slot, card reader, a slim Blu-ray drive, Gigabit Ethernet and built-in 802.11n Wi-Fi. It comes with two configuration – barebone and fully functional nettop with 250GB HDD and 2GB DDR3 RAM which can be extended up to 8GB. The ZBOX looks very attractive as a base for compact, quiet and power HTPC. You need just add IR/RF remote control and USB TV tuner or DVB card if you need. However, Linux folks should check the support of Radeon HD 6310 first. Sure, now ATI drivers for Linux are much much better then two-three years ago. But they’re still not so good as nVidia ones. In any case, thanks to Zotac to give us more then one choice. 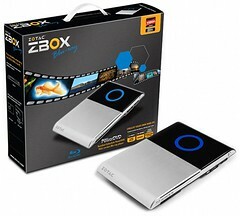 The ZBOX Blu-ray AD03 should be available now. No any words about the price but we can expect something around €500 for model with HDD and RAM.